Kittenwar - Kittenwar rules the web as long as kitten battles are concerned. You really shouldn't miss this website! Puppywar - If you like to engage in puppy battles and you like cute puppy pics then this is the right website for you. Cute overload - Cute overload scours the web to find and propose to its users only the finest in cute animal imagery. Attack of the cute - Attack of the cute proposes a large collection of cute animal videos and photos found online. BuzzFeed animals - In its animal section, BuzzFeed proposes some of the strangest and funniest pics of the web. Rate my kitten - Rate each kitten pic from one to ten. There are thousands of nice kitten pics updated by users. Cute little kittens - In the cute little kittens website you can view and rate thousands of rally nice cat pictures. Catster - Here... kitty kitty! Catster collects and shares helpful and hilarious information for all cat and kitten lovers. Roflcat - Roflcat hosts some of the funniest cat pictures and lol cats. New pictures are added each and every day. Cat channel - A resource center devoted to kittens and cats with topics like cat care and cat breed information. Cats in sinks - Did you know that cats love sinks? Try to visit this website and you will find plenty of cats... in sinks! Cutest paw - On the cutest paw you can find and share some of the cutest animal pictures available on the internet. Cutearoo - Daily pictures and videos of cute baby animals including some great videos of cute cats and cuddly kittens. 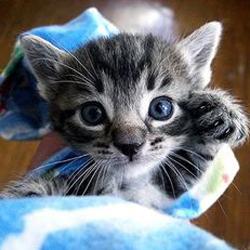 Good morning kitten - Good morning kitten, formerly known as the daily kitten, offers lots of wonderful kitten pics. Daily cute kitten - The daily cute kitten fills up your daily desire of cute kittens with many cute and funny kitty pics. Teh cute - Explore at random photos and videos of cute puppies, cute kittens and many other adorable cute animals. Cat names meow - Cat names meow helps you to find the ...purrrfect cat name for your new little family's member. Adopt a pet - Search dogs or cats near your area and see pictures of dogs and cats who are seeking for a new home. Funny cat pix - Lots of funny cat and kitty pics that you can rate and share with all the other cat and kitten lovers. Daily pets - The daily pets website is a great place for pet lovers and offers funny pet pictures and daily new stories. petMD - petMD helps you on topics like pet health and nutrition, disease symptoms and vet approved treatments. Cute cats - Cute cats picks the cutest cat photos submitted by users and features them for the whole world to see. Discover some of the finest websites about cats, kittens and the animal world. Get your daily dose of cute kitten imagery and funny kitty videos. We have compiled the above list after spending many hours online looking for the best websites about cats and kitties. If you love cats, kittens and the rest of the animal world as we do, you really cannot miss the above list of websites. After visiting some of the websites on the list you won't be able to tell us that you didn't fill your desire of cute kitten pics and videos... we are pretty sure of that! All cat and kitten lovers will be amazed to discover that today the web is so rich of resources dedicated to cats and the animal world in general. From the strangest and funniest pics of the animal world to the cutest cat and kitten pics, from the cuddliest kitten videos to the most favorite kitty names. Some websites on the list also offer some very useful and practical info such as adopting a pet in your area, caring for your cat, breeding little kittens as well as excellent hints on pet health and nutrition.